I'm not sure where to start so maybe I'll go with what is making me happy these days. I just celebrated my 55th birthday - yikes! I have no problem with being 55, it's just that when I say it outloud it doesn't feel right. Ever since turning 50 I get a small shock or jolt whenever I have to tell someone my age. Can I really be 55 when I only feel 30ish? I have this image of myself that doesn't quite match up with the person I see in passing mirrors and windows. That person looks more and more like my mother! Not that looking like my mother is a bad thing, as I always thought she was lovely, it's just that she was a lot older than me. Oh well. I am getting better at accepting the sags, wrinkles, crinkly knees, odd spots, etc. that mark the passage of time. 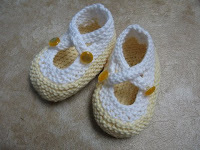 I have been madly knitting and quilting over the past few months. 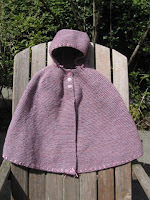 My most recent finish is a hooded baby cape that should fit Ryleigh this fall and winter. 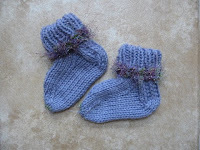 I have also almost completed a cardie for myself, socks, booties. In the quilting department I made a lovely batik quilt for my pseudo-daughter (my daughter's best friend) and another for her mother who turned 60 this month. I quilted some placemats that turned out to be very cool even though the pattern was not ADD friendly and I spent a lot of time taking out seams and re-sewing them. I think I'll close for now as my tummy is asking for breakfast.